Gertrude Eichor Davis was born July 27, 1919 to John Pierce Eichor and A. Z. Miller Eichor in Lindsay, Oklahoma. 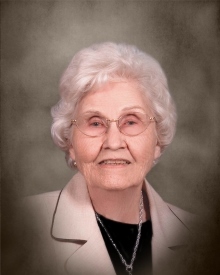 She passed away August 26, 2018 in Marlow, Oklahoma at the age of 99 years. Her service of celebration will be held Thursday, August 30, at 10:00 am in Grantham Funeral Home Chapel, with interment in Ryan, Oklahoma Cemetery. Gertrude was born the seventh of eight children. Her childhood years were filled with hot and dusty days in rural farm areas, playing and working with her siblings; she attended Union Valley High School south of Ryan, Oklahoma. In 1937, Gertrude married Jack Davis. From 1939 to 1980 they lived in Illinois, Ohio and Kentucky as they followed Jack’s work in the oil fields. Gertrude was a brilliant homemaker. She returned to school at the age of 50 and worked for H & R Block as a tax preparer in Kentucky for 10 years. Jack and Gertrude retired to Ryan to be near relatives; she and Jack made First United Methodist Church of Duncan their church home. Gertrude lived in Marlow at West Wind Assisted Living for the last four years of her life. Gertrude learned the importance of family life very early and passed that knowledge to all her descendants, who remember her love and grace. She was preceded in death by her husband Jack Davis, her daughter LaNell Williams, her parents, three sisters and four brothers. She is survived by her son, Lyndel Davis and his wife Jane of Marlow, seven grandchildren, twelve great grandchildren, and seven great, great grandchildren. Memorial gifts may be made to the Employee Flower Fund of West Wind Assisted Living, 111 N. 9th Street, Marlow, Oklahoma, 73055.